One of America’s most divisive issues has been officially decided by the highest judicial authorities in the land, thereby ending a culture war that wrapped up religious groups, fast food chicken restaurants, political activists of all stripes, and the national media writ large. Now, thankfully to those exhausted with the media cycle and all the endless talking, it’s over. It’s decided, and hopefully everyone can move on now. 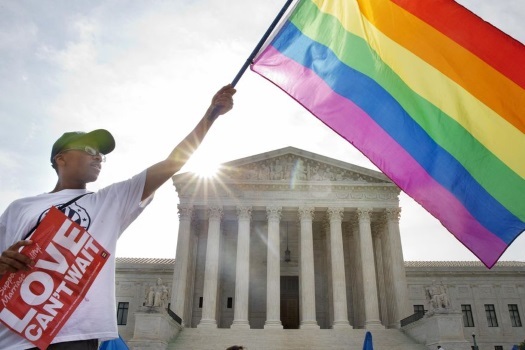 The United States Supreme Court has officially struck down gay marriage bans throughout the country, essentially legalizing gay marriage in all 50 states. Chief Justice John Roberts wrote one of the four dissents in the 5-4 decision, and took the unique step of reading his decision to the courts from the bench. Still, conflict in the court or not, the law of the land is currently that gay marriage is legal and acceptable, and states have 3 weeks in which to either ask for reconsideration of the ruling, but in the states of Alabama, Arkansas, Georgia, Kentucky, Louisiana, Michigan, Mississippi, most of Missouri, Nebraska, North Dakota, Ohio, South Dakota, Tennessee, and Texas, gay marriage is or will shortly be legal.